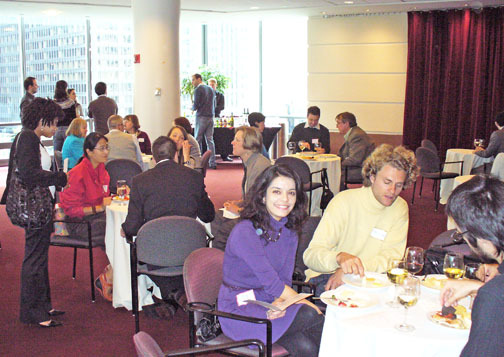 Students and guests enjoying drinks and hors d'oeuvres at the Spring Farewell event that took place at the Gleacher Center of the University of Chicago School of Business. Our last Fulbright event was a complete success. 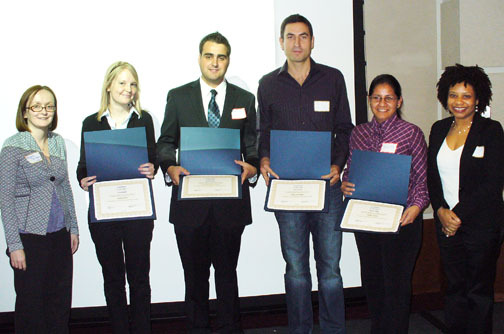 On Saturday May 8, 2010 the Chicago Chapter of the Fulbright Association, the Institute of International Education (IIE), and the University of Chicago’s Graduate School of Business held a reception for the Fulbright students and scholars who were going back to their countries after finishing with their programs. 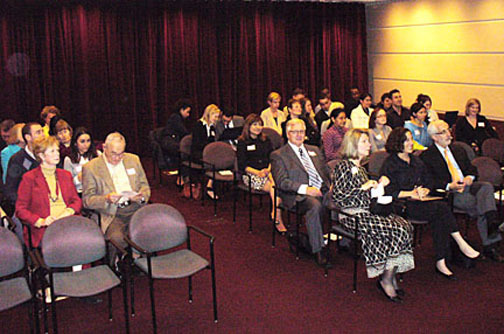 The reception was followed by a presentation offered by by Richard H. Thaler,Ph.D. and Ayelet Fishbach, Ph.D, Professor of Behavioral Science Marketing and Fulbright Senior Scholar. 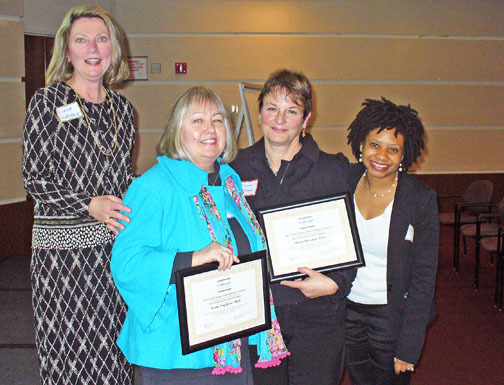 Also, the first Dee Sarelas Service Award ceremony took place that evening. This distinction was awarded to Marilyn Susman, for her invaluable work and service to the Fulbright community. 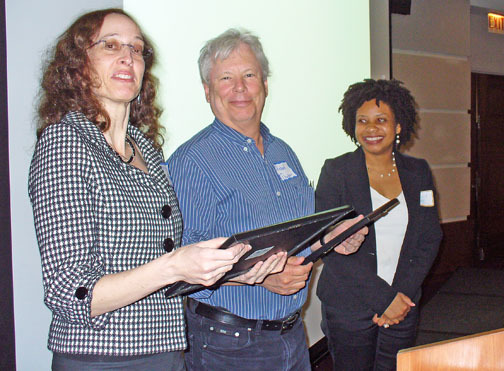 Norma Fay Green and Sharon Silverman with their diplomas awarded for their service to the Fulbright Chicago Chapter. 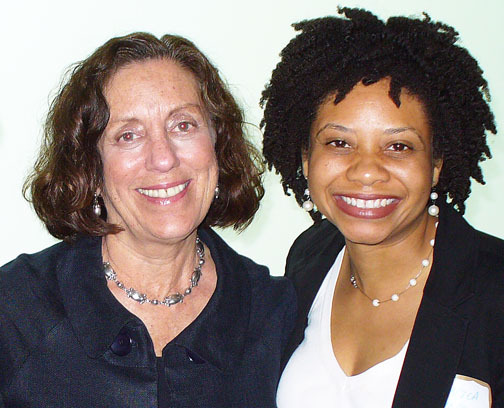 Next to them, board member Linda Gruber and President Monica Swope. This entry was posted in Fulbright and tagged Dee Sarelas Award, Monica Swope. Bookmark the permalink. What a nice setting for our chapter’s farewell event! Not only was the Chicago skyline stellar that evening but so were the speakers. Congrats again to our first Dee Sarelas Service Award winner, Dr. Marilyn Susman, and to our sub-committee for their efforts in carrying forward the idea of this award. The Dee Sarelas Award is an extraordinary recognition to Fulbright Chicago Alumni that have demostrated unconditional services to the national and international communities. No doubt that Dr. Marilyn Susman deserved that award. The Chapter will benefit by having Dr. Susman’s knowledge and guidance for one year as she becomes our chapter ad hoc board member.